Ears are much larger than average dogs and point up. Eyes are a golden yellow. Fur is thick and can be variations of brown, black, grey. 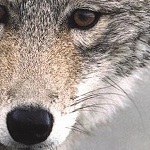 Many urban coyotes are affected by mange, caused by parasitic mites burrowing into the skin leading to fur loss. Mange is contagious to pets. You might be surprised to learn that coyotes did not arrive in Metro Vancouver until the 1930’s and even later in the City of Vancouver in the 1980’s. Why? Well, before European settlement, coyotes were native only to the deserts and grasslands of the Midwest United States. Following increasing agricultural and urban development, combined with the wide-spread destruction of wolves (a natural predator and controller of coyote populations), coyotes had spread to most parts of North America by the mid-20th century . Like grasslands and deserts, our urbanized and cultivated areas have lots of open space and food sources for coyotes, most especially rodents. Considered one of the most adaptable wild animals, coyotes now inhabit almost any terrestrial environment in North America. Coyotes primarily eat mice, squirrels and rabbits (80% of their diet), but will take almost anything they can get a hold of. If available, they will eat fish, fruit, berries, nuts, eggs, and garbage. 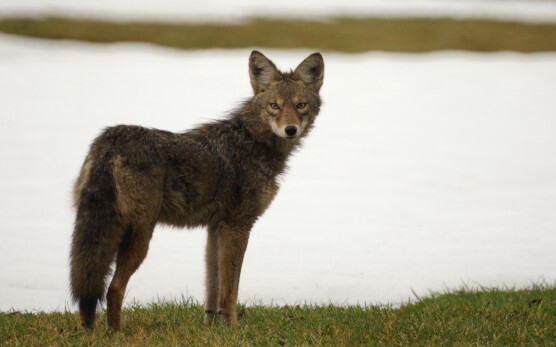 They have been known to prey on cats and small dogs, although this accounts for only 1-2% of an urban coyote’s diet. Find out how to keep your pet safe, or make your backyard and neighbourhood safe from coyotes by learning How to Co-Exist with coyotes. Coyotes are naturally active during the day and night. You might think they are nocturnal, but they have adapted their behaviour in cities to avoid humans in the day time and will do most of their hunting and travelling at night or during twilight. Have you seen a coyote in the daytime? Please report it using our online report form, or call our info-line 604-681- WILD (9453). The coyote is a prominent character in Native American and First Nation’s storytelling. Commonly portrayed as a trickster, Coyote often gets into mischief with spirits, humans and other animals.